The players are different nations investigating the ocean and the Swarm. You establish research stations from which you send out ships to gather water samples in the form of swarm tiles. Researchers analyze the gathered tiles and then return them to the ocean. Endeavoring to establish contact with the swarm-queen, you mark the tiles that you place back into the ocean with your buoys. The winner is the player who has the most research points at the end of the game. But take care: there are dangers lurking in the depths! 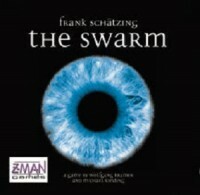 Add a Review for "The Swarm"